Quite regularly, our customers ask us about the reasons we use whey protein in our products, specifically BioVITES. 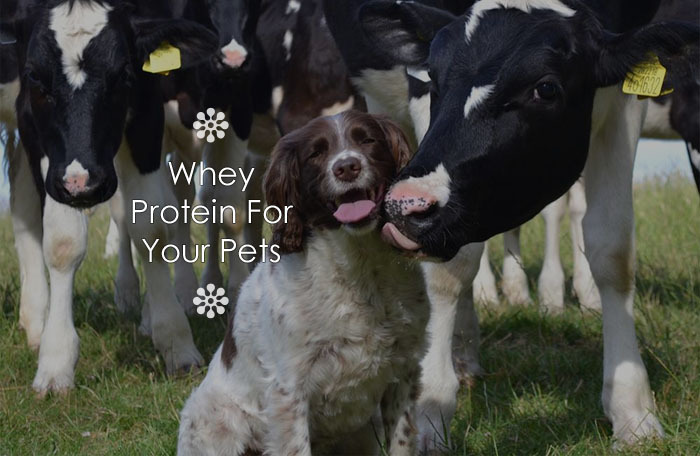 Let’s look at the important health benefits whey protein has for your dogs and cats. Originally, whey was simply a by-product of cheese production. Cheesemakers did not have a practical use for this liquid that separated from the milk solids (casein). By the late 1970’s scientists discovered that whey protein had clear nutritional benefits for humans and of course, for pets. “These proteins are easily digestible and for this reason earned a reputation of an effective protein supplement for body builders and athletes. Cysteine is an amino acid and a building block of glutathione. It impacts how fast and how much glutathione a body can produce. Antioxidants combat the detrimental effects of cellular oxidation—a naturally occurring process in your pet’s body. Some of the cells in this process become damaged and unstable particles known as free radicals. Free radicals seek healthy cells to repair and stabilize themselves, weakening healthy cells in the process and creating an unhealthy chain of events. Antioxidants limit the effects of free radicals by encouraging their exit from the body naturally, minimizing further damage to healthy cells. One can see that glutathione is an important part of disease and cancer prevention not only for humans but for your pets as well. Denatured whey has had its bioactive properties diminished by over processing. While all milk (the source of whey) must be pasteurized, by law, further processing destroys the cysteine bond and lowers the protein’s ability to produce glutathione. “…denaturation of whey proteins is a breakdown in the protein structure…that does not affect the food value of a whey protein, but affects its bioactivity. Undenatured whey, which we use in our BioVITES, is processed at a minimal level and retains its immune boosting qualities. The protein keeps its cysteine bond and helps the body produce glutathione, vitally important for disease and cancer prevention for your dogs and cats. BiologicVET supplements are a carefully designed holistic system, formulated to work synergistically to maximize the nutritional content of your pet’s diet. The naturally-sourced ingredients are chosen for their high bioavailability of nutrients and the formulas are specifically designed to meet the unique gastrointestinal and metabolic needs of canines and felines.